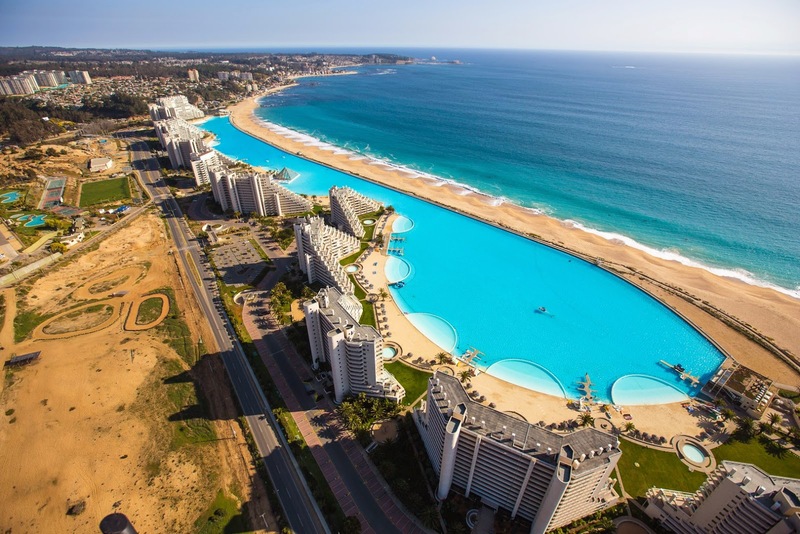 If we talk about place of an area of 20 acres and stretches along the miles ,it will occur to our minds that we are talking about large farm, or maybe a plot of land earmarked for a project, but in fact what we are talking about is a swimming pool, it is the largest in the world, and was recorded in the Guinness World Records Book when the resort was opened officially in December 2006 as the largest and deepest pool on the earth, and one of the resort's facilities " San Alfonso del Mar " in Chile's State. 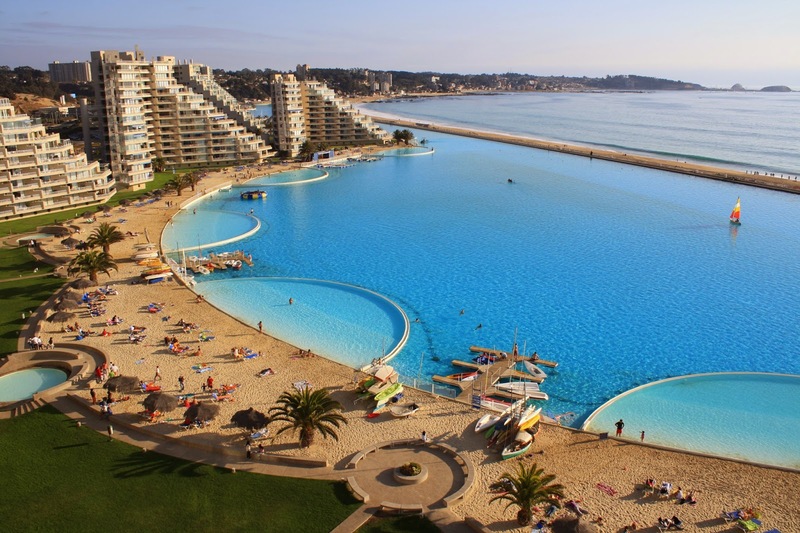 Resort of San Alfonso del Mar is about 90 miles west of the Chilean capital " Santiago" , in a city overlooking the Atlantic Ocean called : Algarrobo, this resort has become a popular tourist destination and a favorite of many tourists in Latin America. 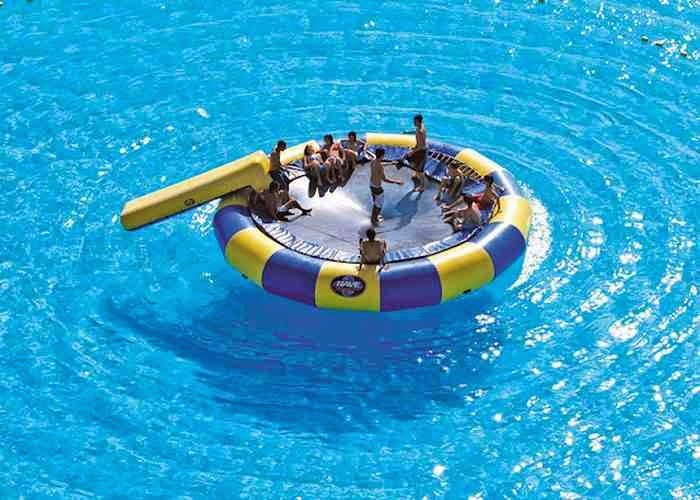 Many of those who visited the resort or read about it may wonder because the resort on the shore of the Atlantic ,so, what is the benefit of this large pool which is only several metres away from the ocean? 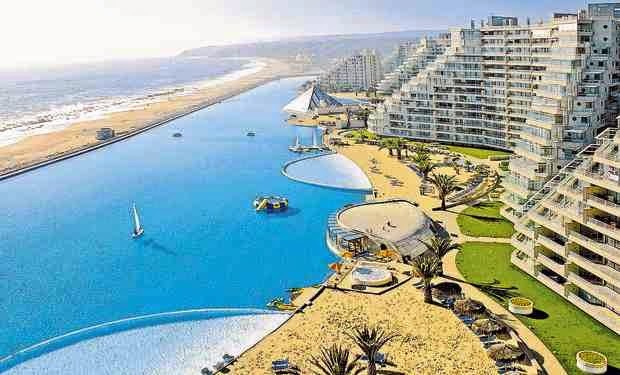 Fernando Fischmann the founder of the resort and the idea answer us , where he began this project in 1997 in an attempt to attract millions of tourists, but the problem encountered him that this part of the Ocean is not safe for swimming, thus obstacle his goal ,and here came the idea, where Mr. Fischmann decided to create a giant pool where tourists can practice all water sports freely and safely in the crystal water sparkling in the sun. 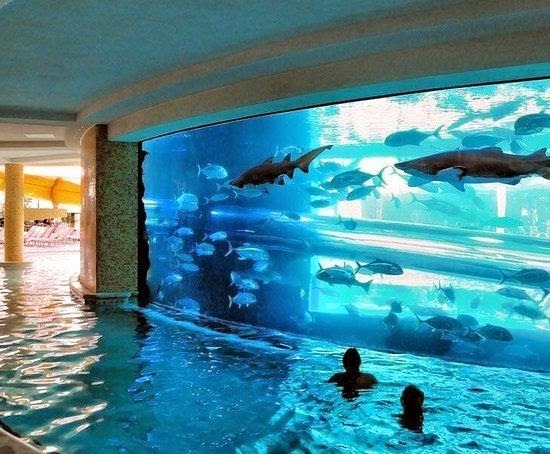 Fischmann traveled around the world to search for the latest technology in this field, and all available options at the time were very expensive, and finally settled on the Chilean company Crystal Lagoons Technology and applied this idea on the ground for a billion and a half dollars, plus $ 4 million paid annually for maintenance work, the company recorded this patent, and now offer this technology of resorts for 160,000 dollars per acre. The pool contains over 250 million litres of water pulled from the Ocean by giant pumps, and this quantity is sufficient to 8,000 swimming pool of the kind that we see always in resorts and hotels, pool depth of 115 feet (35 meters), the water passing through huge filters to remove impurities, and then go on to raise the temperature of nine degrees Celsius than in the Ocean . San Alfonso del Mar resort offers many activities, most notably the new tourist activity of its kind in South America, is a pyramid-shaped glass swimming pool, a favorite destination of tourists in the winter when the water's temperature is low and the atmosphere be cloudy .Entering in the pyramid offers them warm water , hot sand, waterfalls, and a massage with water or so-called water-jet massages. Other activities ,a school for teaching the kayak ,which is a boat for two persons take them on a fascinating journey into the pool, as well as scuba diving school ,and a health center built on the edges of the pool with all modern methods, as tourists enjoy the wonderful restaurants overlooking the indescribably view of pool and the ocean, including a restaurant " Cafe SubAqua " which serves Chilean and international cuisines and restaurant " Pub Bahia Norte" ad hoc in marine meals and shellfish. New activities provided by the resort " San Alfonso del Mar" ,such as reducing weight by hot water, where the tourist enters the pool and practice quiet sport in hot water mixed with certain materials to dissolve fat known as Aqua Fitness, the resort also offers the opportunity for the elderly and children to a picnic into the pool by boats called Water Shuttle, plus yachting service where the resort has a large number of yachts offers cruises in the Ocean, and other activities for those who have taken enough of water activities and they have the audacity to try balloon flights around the resort. 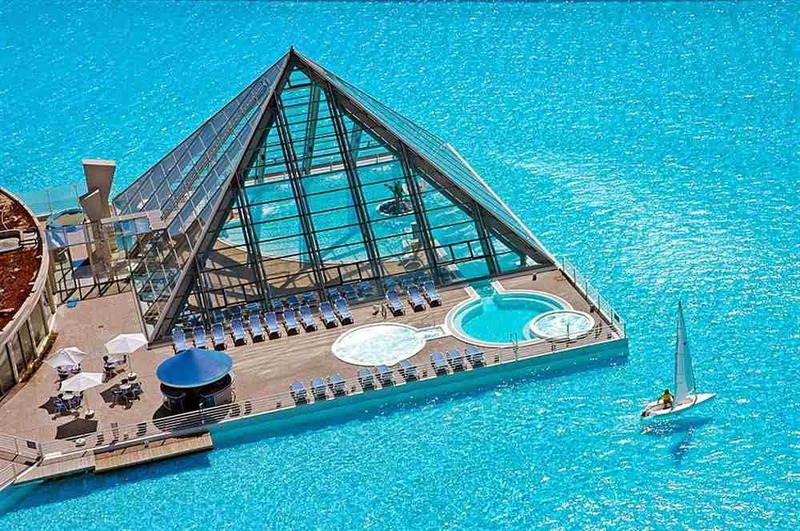 The rooms at the San Alfonso del Mar resort are in a several pyramid-shaped buildings, all overlooking the Atlantic Ocean and the giant swimming pool, the rooms available in different sizes, including 2, 3, 4 and 5 beds, each with a 100- metre balcony to enjoy the tourist a dined daily on a breathtaking panoramic view.